The next step in the Volvo/Geely venture is the brand new Volvo XC40. Equipped with a great set of engines, AWD capability and interiors that are comfortable and very modern, the Volvo XC40 is an appealing new small SUV that competes squarely with BMW, Audi and Mercedes, not to mention Mazda, Lexus and Honda. Actually, the small SUV market is pretty saturated, but when there’s a new model comes on the scene that’s got some clout to back it up, then most of us will sit up and take notice. What does make the new Volvo XC40 SUV attractive? Let’s see what we can find. Designed with chunkier dimensions, the shorter wheelbase 2018 Volvo XC40 looks funkier than, perhaps, any other current Volvo model. It is the smallest SUV in the Volvo stable, and giving it a lesser rank than its larger siblings would be unfair. 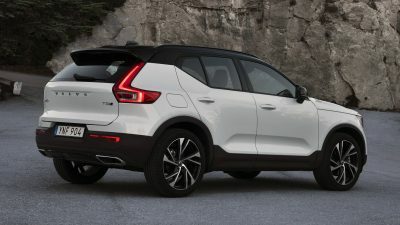 Buyers who are looking for a stylish, youthful small SUV with luxury and safety will be drawn to the XC40 over the bigger XC60 and XC90 models. This new model from Volvo does offer a FWD model which is perfect for the city, while those who desire AWD and some off-road adventure will appreciate the AWD XC40s. Room inside the new Volvo XC40 is great for four adults. A fifth adult can sit in the middle of the rear seat, but the leg space is a bit awkward thanks to the high transmission tunnel running along the centre of the floor. The Volvo XC40 has a good size boot that can pack away plenty of luggage thanks to the flat floor design and dividers. 460 litres of boot space is available with the luggage shelf in place, and this can open up to 1336 litres with the rear seas folded down. Focusing on the smooth petrol versions of the new XC40 reveals that there are three- and four-cylinder petrol engines available. Volvo XC40 shoppers who are after petrol power will be impressed with the smooth delivery of the very modern engines. T3, T4, and T5 petrol engines are turbocharged, producing 115 kW, 140 kW and 184 kW respectively. This is some decent performance that can hustle the XC40 along nicely. On the open road, even the T3 ticks over nicely at highway speeds in total stability and predictability. 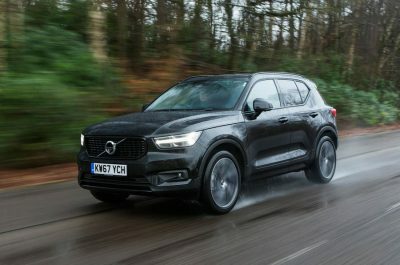 The XC40 T3 is available with front-wheel drive and a manual gearbox only, while the XC40 T4 and XC40 T5 have AWD and a smooth eight-speed automatic. There are diesel models available and even a hybrid, but we’ll take a look at those in another review. Handling is good, however with the smaller wheelbase, the nastier road undulations at city speeds can occasionally be felt through the otherwise comfortable chassis. There is nice precise steering feel, and well-weighted open road handling. All-in-all a nice small SUV package. All of the models feel pretty cool and offer a special cabin space for travelling. Top-shelf technology helps bring out the fuzzy feelings. The same 9-inch portrait-layout infotainment display graces the XC40 dash, as well as a 12.3-inch digital instrument panel – all very nice. The nine-inch portrait-format system, with its ‘collapsible blinds’ interface is easy to use and looks superb. Sat nav, Android Auto and Apple CarPlay are all available. As with the larger Volvo siblings, the new Volvo XC40 has plenty of choice to make the car especially yours. The XC40 range has three primary trim levels – Momentum, R-Design and Inscription. With the Volvo XC40 Momentum trim you will enjoy a well-equipped small SUV that is loaded with features like cruise control, dual-zone climate control, auto wipers, 18-inch alloy wheels, rear parking sensors, and a 12.3-inch digital instrument panel. 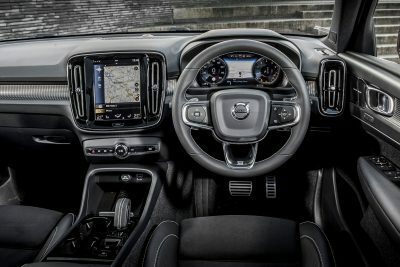 Every XC40 variant boasts Volvo’s highly rated nine-inch portrait-layout infotainment system. A Volvo XC40 Momentum Pro adds a few more luxuries like heated front seats, a heated windscreen, adaptive headlights and auto-folding side mirrors. 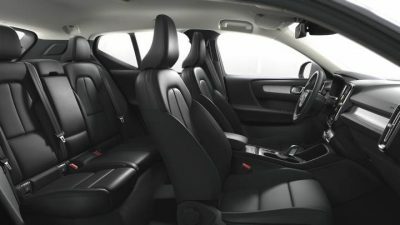 Stepping up to the sporty Volvo XC40 R-Design models and you add features like leather seats, tinted windows, leather on the steering wheel and gear knob, auto-folding side mirrors, a different design of diamond-cut alloy wheel and gloss-black trim. Then Volvo XC40 R-Design Pro jazzes things up even more with heated front seats, adaptive headlights again, 20-inch alloys and a powered driver’s seat. Top of the range Volvo XC40 SUVs will be found with the Inscription model being the most loaded variant. Features like special ambient lighting, a powered tailgate, metallic paint, front parking sensors, 19-inch alloys, LED fog lights, and a matt-silver finish on the front and rear skid plates keep the small SUV looking exceptional. An optional panoramic roof is available. Clever Volvo design has speakers mounted high in the dash instead of taking space up in the door panelling. This simple design feature has given the new XC40 some massive door storage compartments. There is a folding hook integrated into the glovebox design that keeps food containers stable. A compartment between the front seats is both removable and washable, and a handy wireless phone charging pad and USB port at the base of the centre console makes smartphone users very happy. Volvo’s safety won’t need to be doubted, but we’ll wait to see the final result for crash testing which I can bet will be five stars. Safety is always a big priority for Volvo, and the XC40 boasts all the best features that include automatic emergency braking across the range. This system is capable of spotting not only cars but also pedestrians and large animals around the vehicle. Each new Volvo XC40 model gets a lane departure system which will intervene and pull the car back into the right lane if it detects you’re heading off into the path of oncoming traffic. Buy a petrol version of the new Volvo XC40, and you should be happily motoring for many years to come. Volvo offers flat servicing costs and a decent warranty. For any more information on the new Volvo XC40 or, for that matter, any other new car, contact one of our friendly consultants on 1300 303 181. If you’d like some fleet discount pricing (yes even for private buyers! ), we can submit vehicle quote requests out to our national network of Volvo dealers and come back with pricing within 24 hours. Private Fleet – car buying made easy!